Apple has reportedly put together a huge team of experts to work on its virtual reality initiative and has built headset prototypes. This "secret research unit" is said to be comprised of hundreds of staffers picked up through various acquisitions, according to the Financial Times. Others were poached from firms already working on virtual and augmented reality technologies, including Microsoft's HoloLens, and camera companies like Lytro. Apple confirmed is latest acquisition is a company called Flyby Media, a start-up that makes tech so phones can "see" the world around them. Flyby worked with Google to develop software for the search giant's Project Tango 3D-mapping tech. It's just the latest in a string of VR and AR-related acquisitions for the company, and it won't be the last. In 2013, Apple picked up 3D-motion tracking company PrimeSense and last year it bought both AR company Metaio and face animation firm Faceshift. Now, Cupertino is said to be looking to buy up optical technology firms so it can put a bow on its VR headset. Apple has assembled large teams dedicated to next-gen projects before, and it sounds like the VR group is making headway. According to the report, Apple has been cranking out prototypes of potential headset configurations for several months. 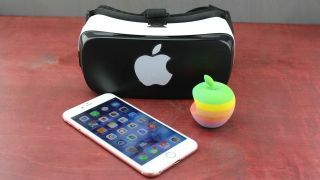 It's unclear at this point whether Apple's headset will be in the vein of Oculus Rift, or whether it will follow Google Cardboard and Samsung Gear VR in crafting a headset that houses an iPhone for a mobile virtual reality experience. Or, it may go the route of HoloLens for a mixed reality offering. Also up in the air is when Apple will release its headset, if ever. This apparently isn't Apple's first foray into making a VR headset: Under Steve Jobs, a small team put together some headset prototypes and filed patents of potential designs in the mid-2000s, but the project was abandoned when the tech was deemed immature, according to the Financial Times. Today's news comes a few days after a company earnings call on which CEO Tim Cook said virtual reality isn't "niche." "It's really cool and has interesting applications," Cook said of virtual reality. The safe bet is on Apple releasing a VR headset, at some point. Another potential area where Apple could use its acquired talent and tech is in the Apple Car. While both are certainly possible, we're inclined to think an iVR headset will arrive long before the Apple Car ever hits the road.